On a cold Friday morning, Australians woke to some news worth celebrating. 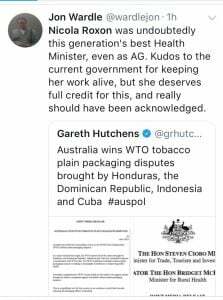 In a move that, as Simon Chapman told ABC Radio’s Jen Fleming, was “very significant but not unexpected,” the World Trade Organisation found in favour of Australia in challenges from Cuba, the Dominican Republic, Honduras, and Indonesia, to our tobacco plain packaging laws. Chapman told Fleming that the finding was unsurprising because the laws had been challenged and upheld three times before. 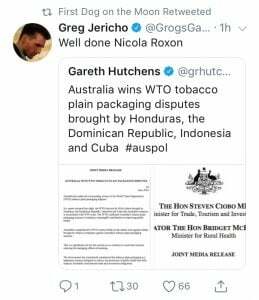 For those of us with short memories, that’s once in the High Court of Australia in 2012 (major tobacco companies including British American tobacco, Philip Morris, Imperial Tobacco and Japan Tobacco were roundly defeated, 6-1), once at the Permanent Court of Arbitration in 2015, when Phillip Morris claimed Australia was in breach of a Bilateral Investment Treaty, and once before at the World Trade Organisation. 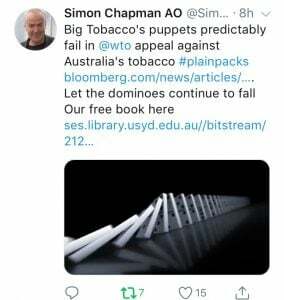 As Chapman has said before, there is bound to be another appeal, or another action, or an action from another angle but, in the meantime it’s worth celebrating Australia’s leadership, and the message that the finding sends to other countries as plain packaging “dominoes” around the world. 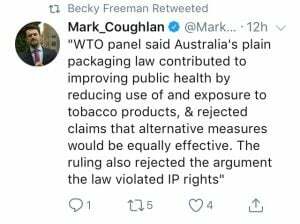 “I fully expect that plain packaging will become the norm within fifteen years around the world,” Chapman told Fleming. 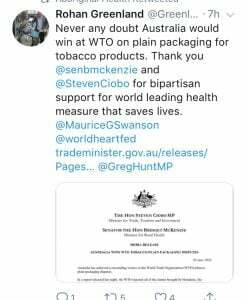 A joint statement from federal Trade Minister, Steven Ciobo, and Bridget McKenzie, Minister for Rural Health, described the panel’s report as a “resounding victory,” and reiterated the Government’s commitment to defending any appeal proceedings. 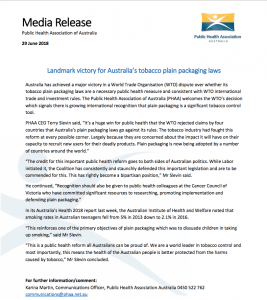 A statement on behalf of of the Public Health Association of Australia from CEO Terry Slevin, said plain packaging had been an effective reform that had enjoyed bipartisan political support and effective public health assistance, particularly from the Cancer Council of Victoria, with implementation. 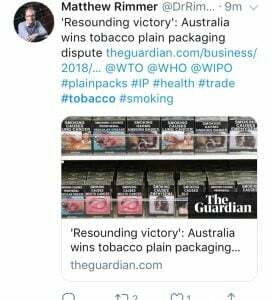 Kylie Lindorff, Manager of Tobacco Control Policy at Cancer Council Victoria, cited the Government’s post-implementation review, saying that it had been estimated that Australia had 100,000 fewer smokers as a result of plain packaging. 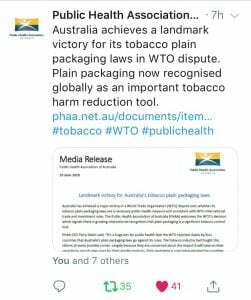 “Plain packaging is an important part of Australia’s long-standing and comprehensive approach to tobacco control.” She said in a media release. 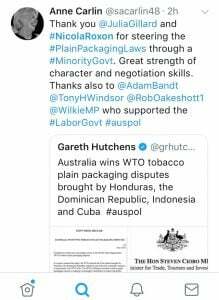 Below are a selection of responses from Twitter, including some from those who have been around long enough to remember plain packaging’s original political champions. 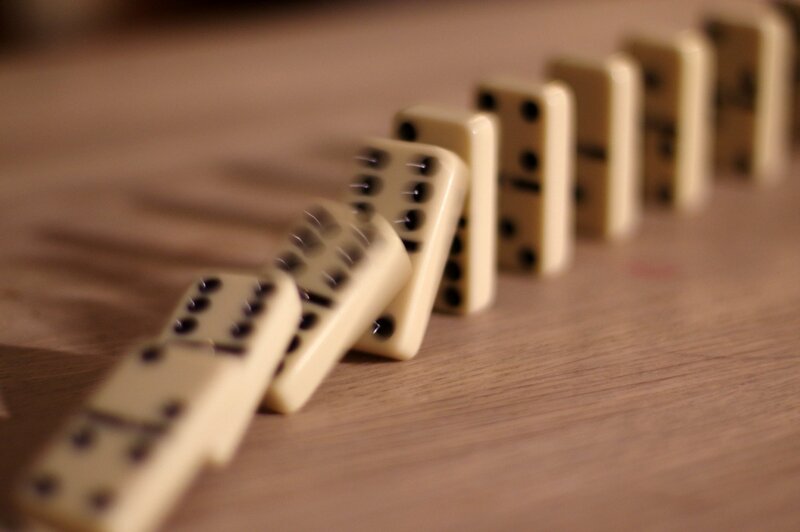 May the dominoes be perfectly aligned!